The study examined in simulations the interaction between a muscle relaxant and an antagonist that binds the free molecules of the relaxant, as experimentally demonstrated for rocuronium and sugammadex. The hypothetical muscle relaxant D and the hypothetical antagonist X were assigned pharmacokinetic properties to define the time course of their concentrations in plasma, and pharmacodynamic properties to define binding of D to either X or the receptors at the motor end plates. D, X, and their complex DX were postulated to diffuse between plasma and the effect compartment. The first and the fourth twitch elicited in sequential trains of four stimuli were evaluated in a model of neuromuscular transmission. The rates of reactions were formulated as differential equations and the equations solved numerically. If the affinity of D for X is comparable to that of D for the postsynaptic receptors, doses of X two to four times larger than the dose of D produce a fast and a complete recovery of the twitches. Smaller doses of X or lower affinities of D for X accomplish a slower and only partial recovery. Additionally, the complete restoration of twitch strength within 2 min after the injection of X requires that X and DX diffuse into the effect compartment. 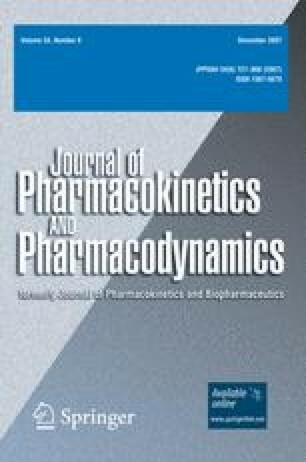 The simulations reveal the physicochemical, pharmacokinetic, and pharmacodynamic properties of an antagonist that restores twitch strength by sequestering the free molecules of the muscle relaxant.